Aut Even Hospital remains open today (Thursday March 1st), however, all elective surgeries from lunch time today have been cancelled. As a result of the severe weather warning and in line with national guidelines, all out-patient appointments and scheduled surgeries for tomorrow, Friday March 2nd, have been cancelled. Should you have any queries in relation to appointments or surgeries please contact Main Reception on 056 775275 or your Consultant’s secretary. Weather permitting, we envisage that all in-patient and out-patient appointments will go ahead on Monday March 5th as previously planned. 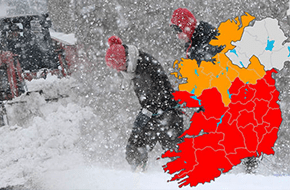 A STATUS RED Snow-Ice Warning is now in place for all counties so we advise that Hospital visitors be mindful of this. This STATUS RED warning is valid from Wed (Feb 28th) 11pm until Friday (Mar 2nd) 3pm, therefore visitors to the Hospital should not travel to the Hospital close to or during these times. We would like to take this opportunity to thank our staff who have made huge efforts to get in to work in order to ensure that our patients continue to be well looked after throughout #StormEmma.